Pintabians are graceful, animated horses that are known for their beauty, stamina, versatility, and good disposition. Although Pintabians can also be registered as Pintos, they are more specifically referred to as an Arabian-type horse with spots. 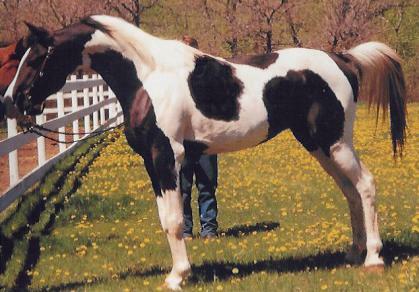 Pintabians have tobiano markings and over 99 percent Arabian blood. They became officially recognized in 1992 when the Pintabian Horse Registry was established. While its tobiano markings are one of its distinguishing characteristics, the Pintabian is not a color breed. Arabian does not have a spotted coat. In order to have a color pattern, there was a tobiano pinto, 7 generations ago that was crossed with an Arab. The tobiano color pattern is defined as non-symmetrical, with large irregular color spots. As each generation produced this spotted Arab, it was mated back to a 100% pure Arab to gain back the Arabian bloodlines until the Pintabian was produced. Because the tobiano gene is dominate, genetics experts have known that is was possible to breed this pattern into an Arabian to produce a relatively pure strain of tobiano horses with over 99% pure Arabian blood. Some of the conformation standards include a beautifully formed head that is wide between the eyes with a slightly concave profile. The eyes are bright, clear, and kind. The nostrils are large but the muzzle small. The back is short, strong and muscular, the chest broad and the shoulders long with good slope. The Pintabian stands between 14.2 and 15.2 hands high.